In 2006, after 25 years in practice, Andrew Rogerson founded the Rogerson Law Group. Since then, the firm has flourished and now has ten lawyers. Andrew and the firm have won many awards over the years as leaders in the field of asset protection. 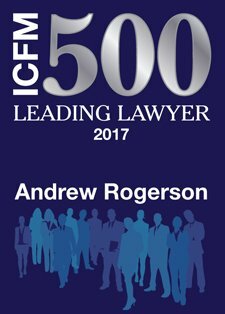 Andrew was recently honored by being adjudged one of the Best 500 Lawyers in the World by InterContinental Finance & Law Magazine. Andrew’s growing practice focuses on Litigation and Asset Protection, using offshore tax havens, and the Law of Tax Residency. An experienced cross-border advocate, he is a leading authority in Canada on asset protection structures and litigating trust issues – with 11 years’ experience practicing in offshore tax havens. His work also encompasses Business migration to Canada. Andrew represents clients as far afield as Dubai and London, where he visits regularly. Andrew’s early practice in insolvency and bankruptcy litigation grew to encompass asset protection with an international focus. He has earned a formidable reputation as a successful litigator, having conducted hundreds of trials, applications and appeals both in Canada and overseas. He also undertakes several pro bono criminal trials each year. Andrew was called to the Bar of England and Wales in 1981 by Middle Temple and served his pupillage in the Insolvency Chambers of Michael Crystal QC, at 3-4 South Square, Gray’s Inn. Since then, his extensive international legal experience includes practicing in South Africa, Australia, the Turks and Caicos Islands, Jersey (Channel Islands), Ontario, Alberta, and as a barrister in London. He is also a Fellow of the Society of Trust and Estate Practitioners (STEP). Cross-border Family Litigation: Andrew successfully represented the wife in the case of Wang (Hong Wang (aka Jennifer Wang) and Wei Lin FS-12-377 681) an acrimonious family dispute in the Canadian courts which involved very wealthy spouses who immigrated to Canada from China. The judge had to consider critical issues about the authority of the Canadian court to rule in matters involving highly mobile and wealthy immigrants. The case involved millions of dollars held in overseas tax havens, significant bank accounts, expensive properties in both countries, as well as the couple’s children. Andrew and his team obtained a freezing order on behalf of the wife to prevent her husband moving any assets beyond her reach in a future divorce settlement. This was followed by a similar order in the British Virgin Islands. Child custody issues also arose and Andrew successfully represented his client in resisting claims that she had removed her children from China. Asset Protection and Bankruptcy: Andrew acted in another landmark ruling in which the Ontario Superior Court rejected the ‘Collateral Attack’ defence often used in Fraudulent Conveyance litigation. The judgment in the case of Peake v Dashney has wide implications for practitioners engaged in asset protection, trustees in bankruptcy and counsel engaged in attacking or defending dispositions involving Orders made in Family Court property settlements. Andrew’s analysis of the case is published by the Society of Trust and Estate Practitioners A New Judicial Trend? Involuntary Support: comment on a case involving a deceased who gave financial help before his death, to an ex-spouse with whom he had no contact for several decades and no legal obligation to support. 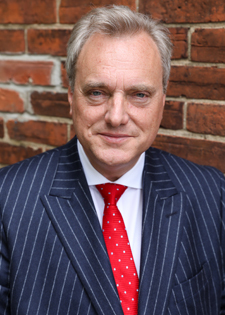 What sets Andrew Rogerson apart from any other lawyer is the peace of mind he delivers when handling any of your legal matters. The worry of any legal matter can be overwhelming, however through his professionalism and developed talent, Andrew eliminates this. Andrew brings a lot of international knowledge and experience to the table. … a competent and outstanding lawyer… an excellent litigator who is persistent in his approach and unflinching when confronted with vigorous opposition.